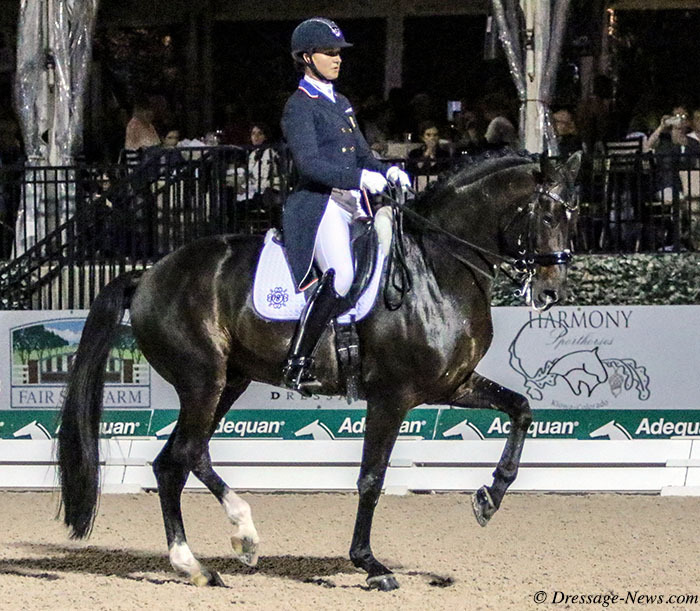 WELLINGTON, Florida, Feb. 8, 2019–Brittany Fraser-Beaulieu rode All In to win the Adequan Global Dressage Festival CDI5* Grand Prix Freestyle under lights Friday night, to complete a double Big Tour victory in what she said may be the last competitions for Canada’s top ranked pair before taking a baby break. Adrienne Lyle, Olympic and double World Games rider for the United States, rode Salvino to win the CDI5* Grand Prix Special. 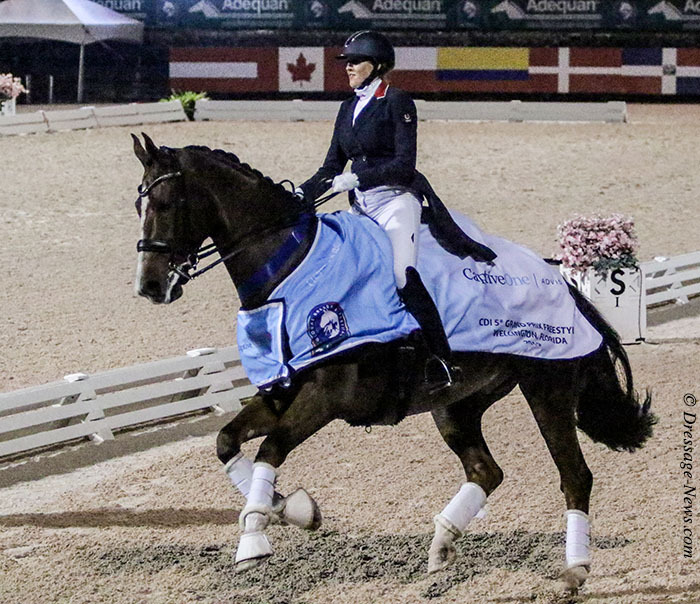 Brittany and the 14-year-old KWPN gelding were awarded 76.520 per cent in the freestyle, a day after capturing the Grand Prix in the highest ranked competition in North America. Katherine Bateson-Chandler of Wellington and Alcazar were second in the freestyle on 75.705, the same placing as the Grand Prix. Christoph Koschel riding the 11-year-old Ballentines in the pair’s first Grand Prix Freestile was third on 73.780 per cent. In the Grand Prix Special, Adrienne, based in Wellington in winter, and Salvino, a 12-year-old Hanoverian stallion, scored 73.574 per cent. Shelly Francis of neighboring Loxahatchee and Danilo were second on 70.468 per cent with Joanne Vaughan of Georgia on Elmegardens Marquis third on 66.511 per cent. Adrienne said it was first time she had ever ridden a Special under the lights. Brittany, who is expecting her first child, that she said is a boy, in mid-June, said this probably was her last competition until September. Christoph, a regular competitor on the Florida winter circuit, rode Ballentines under lights for the first time as well as the first freestyle.